As a part of Visualia Festival – the festival of new technologies, 3D video mapping and lighting design the record for the largest photography of people forming a light sign, known as the “Light Postcard” was broken in the Arena. The latest record for that category, called the “largest human torchlit image”, stood at 3,777 participants and the main goal was to exceed that number; the record was broken since there were over 4.013 visitors in the Pula Arena! The sign that they formed was “Pula+Istria”. 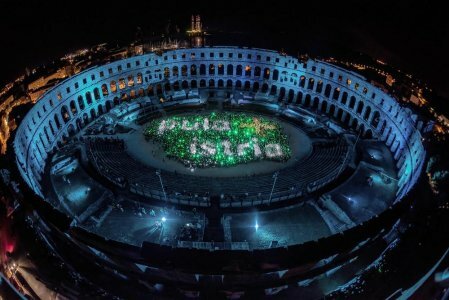 So, Pula light postcard was created in the Arena, a sight and event that will enable Pula to make history. Festival Visualia sponzors: Arenaturist, HPB – Hrvatska poštanska banka-podružnica Pula, ARA Electronic, IDD Production & InEventum!